Hope this isn’t bad form...but does anybody have any news on when the Swamp will/if ever put the Rodents back up...or if any new blades will debut? I have to admit...Swamp are my favorites of the Kin. Pull out your crystal ball and gaze deeply. ‘Tiz dark times in The Swamp indeed. THAT sounds like something a BOT would say! I tend to like Swamp designs the best. when is the Mischief7 coming out? You’d have to ask Private Klink to return at least the design drawings back to the Swamp... suppose, if he returned the prototypes as well, it’d sped up the process greatly! I also would like to see some more swamp rat production. @Kootaga13 got me a ratweiler and now I seem to be addicted to watching the busse adds for swamp rats to show up. Half my problem is I don't know what I want next because the ratweiler covers so many uses and then they sell before I am willing to commit to the cost. 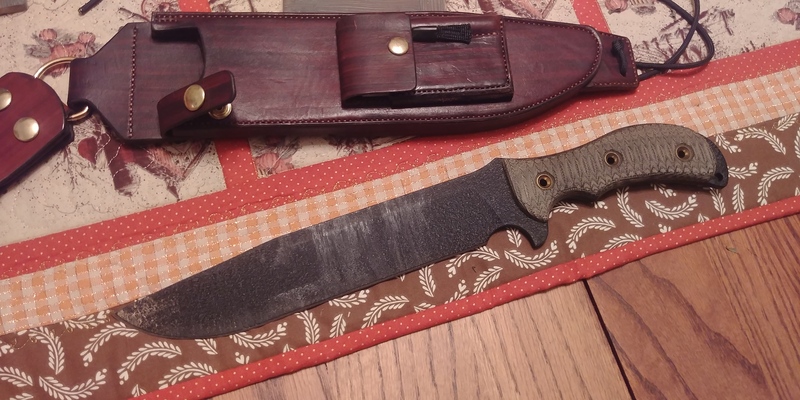 Kind of wish there was the same knife handle but another 4 inches on it and thinner blade stock for trail maintenance of thinner stuff, which I deal with a lot. 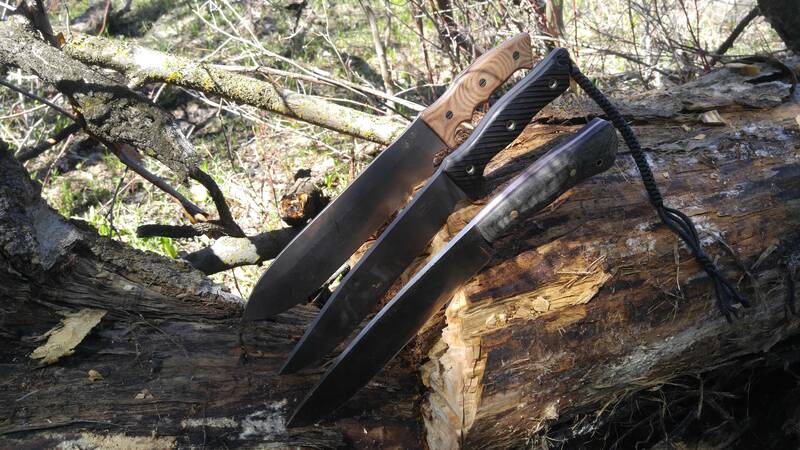 I hate the handles on my other machetes/goloks. And why not have SR-101 instead of basic carbon steel? Hey BE. I'm glad to hear you still like the Ratweiler. I'm also glad to hear that she gets out and goes trail clearing with you. I'm sure the Rats would love to see some of those pics from time to time. 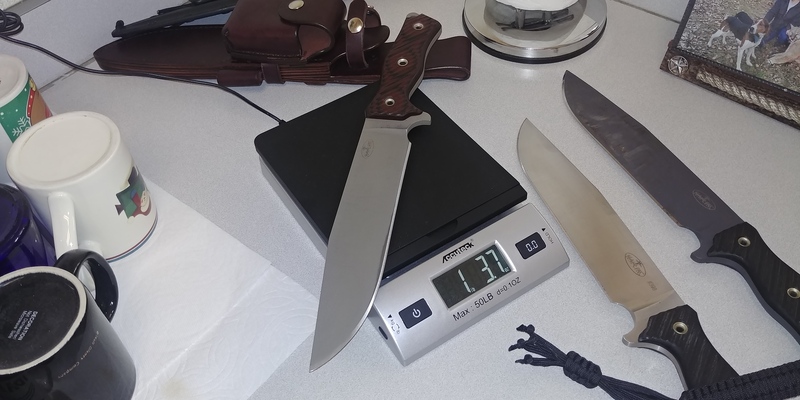 I know there are longer blades, and I'll let the others here, chime in as to their names, but the thickness is an issue. Also, that run of Ratweilers came in two thicknesses, 1/4 and 3/16 of which you got the thinner one. Maybe @Hard Knocks or somebody else can join in here? The ratweiler is currently off getting a horizontal leather sheath from @Makael. I also added a vinegar patina so it's a bit darker than the last set of photos. I should have it back next week and I'm just starting to get back out into the woods again after taking a few months off to spend more dedicated time on the bike. And it has been hot and buggy out. I have some prototype photos but I'm asking permission to share them since I think he's going to make a nicer one specific for the rat (prototype was for a piggyback with a mule I was gifted). Here's the sheath he's getting me for the ratweiler and you can see the deep patina it has. 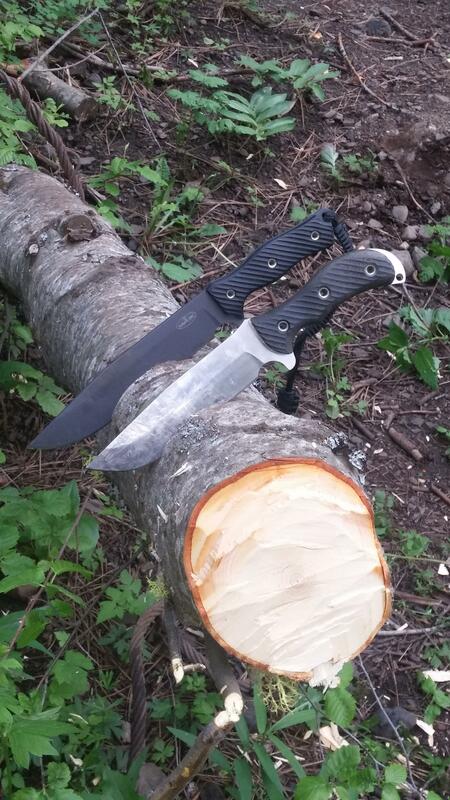 Some of these green plants put some pepper spots all over the blade because I was careless and left it uncleaned overnight after my last day in the woods with it addressing a downed tree I tuned into a log pile/up-n-over for the mtb trail. Swamp rats love to get worked. 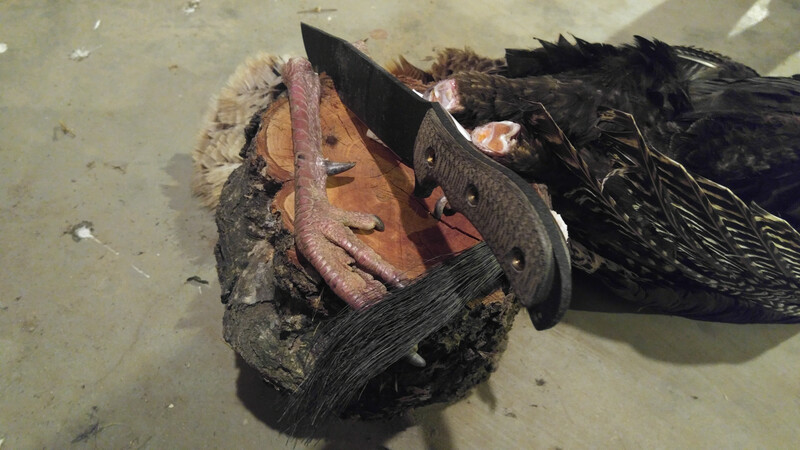 PS, I believe Makael mentioned making a pattern for the ratweiler (and mule) so he should be able to make sheaths for them without sending in the blade now. I know there was a BK4 sheath out there recently he did for another forum member that was really nice. I don't know how his work holds up in the field yet but they sure look nice in pictures. Béma, Yonose and Uncle Timbo like this. That's a drool-worthy image right there. I think you're right about the rat daddy. I've never seen one in the classified but I don't know that I've looked for one. I'll have to start watching. 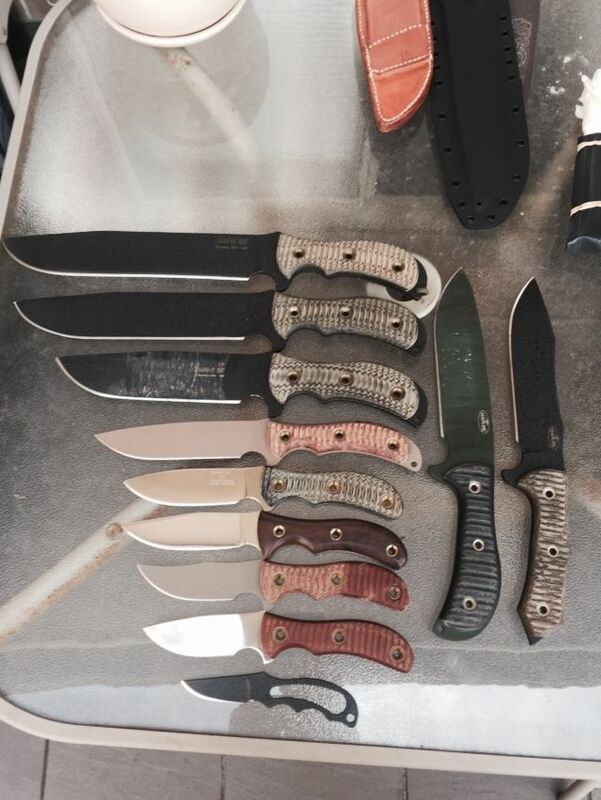 Thanks for the share, that's a very nice collection. Yonose and Uncle Timbo like this.